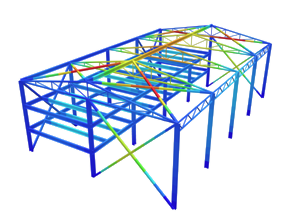 Linear Static analysis is the default analysis method that SkyCiv’s Structural 3D uses to analyze structures. Compared with non-linear analysis, linear analysis is an efficient method of solving a structure as it assumes the structure to behave in an elastic manner. The structure’s behavior is linear (must obey Hooke’s Law). Forces are linearly proportional to deformation. If you double the loads, the response (displacements, strains, stresses) also double. Stress is proportional to strain. When the loading is removed the material must return to it’s original shape. (No plastic deformation). Boundary conditions do not vary during the application of loads. Magnitude and direction do not change with time. All loads are applied slowly and gradually until they reach their full magnitudes. Inertial and damping properties are ignored due to negligibly small accelerations and velocities. Time variant loads which induce considerable inertial and/or damping forces may warrant dynamic analysis. Often, linear analysis is sufficient for the solution of most structures with the structures themselves assumed to have small deformations. Note that modern design codes are written in such a way that there is a large factor of safety already accounted for in the design of a structural element. This makes it ideal for a majority of the structures structure. As the assumptions are elastic, this makes it most ideal with structures that are made of Hookean materials such as steel.